We believe in high-quality, sustainable luxe clothing and accessories to match your lifestyle. We are Treasures: a boutique label dedicated to the creation of slow fashion and handbags with a luxurious bohochic vibe. Our collections are designed to fit any moment – from everyday wear to those special events. Each of our styles are meticulously crafted with love and great care by our team of artisans, featuring intricate detailing paired with a great fit. From genuine leather jackets, fringe wraps to suede ponchos, our boho style clothing and accessories is a fine mix of luxurious crafted styles with an effortless feel. Complete your outfit with the right accessories and bespoke leather handbags. We stock a gorgeous selection of limited edition gypset style leather clutches and bags to go with our boho luxe wraps and jackets, and our Floral sleeve temporary tattoo, non toxic and proudly made in France. When you wear Treasures, you wear more than a luxury fashion piece. You wear a unique handcrafted creation, representing quality over quantity, craftsmanship over automation, and sustainability over fast fashion. You also support artisan communities, ethical business practices and social responsibility - all while looking fabulous! Authentic craftsmanship and a luxurious finish, shape the heart of Treasure's style. 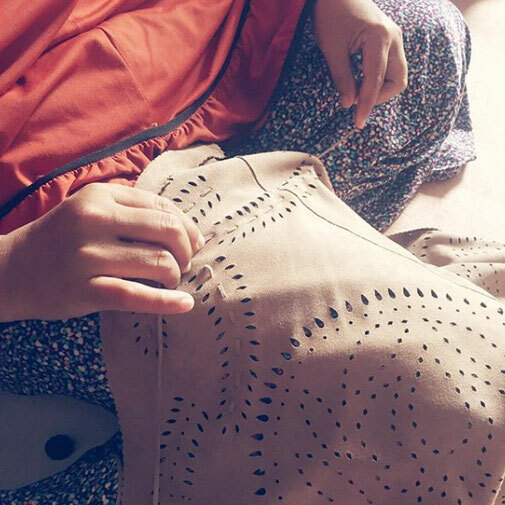 The unique patterns we design on our shawls and jackets are handmade by a select group of talented master artisans. With great focus and attention, they craft each perforation using ancestral tools, finalized with handmade embroidery in the softest and highest quality of suede leather. This exceptional heritage is passed on from generation to generation and we cherish this unique co-creation process with our artisans. Our aim is to not only create fashion and empower artisans but also to redistribute resources. And we'd love you to become a part of it, a member of our tribe that plays fair and with style. By shopping with us, you can now contribute to the process of re-wilding the planet! Follow the Treasures journey – add us on Instagram @treasuresdesign and get boho-inspired today.